Watch the marbles zig zag back and forth through this exciting maze! These tracks help give the Ball Tilt some lively action as the marbles progress through their run. 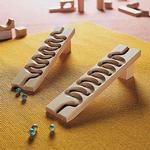 Cleverly designed and made in Germany by HABA, the Winding Tracks Ball Track Accessory Set makes a delightful addition to HABA's Ball Track Construction System. Made of untreated beechwood, this wonderful set is meticulously crafted to withstand generations of play! 2 winding tracks and 6 marbles.